Steven (Chicagoland, United States) on 12 February 2019 in Landscape & Rural and Portfolio. 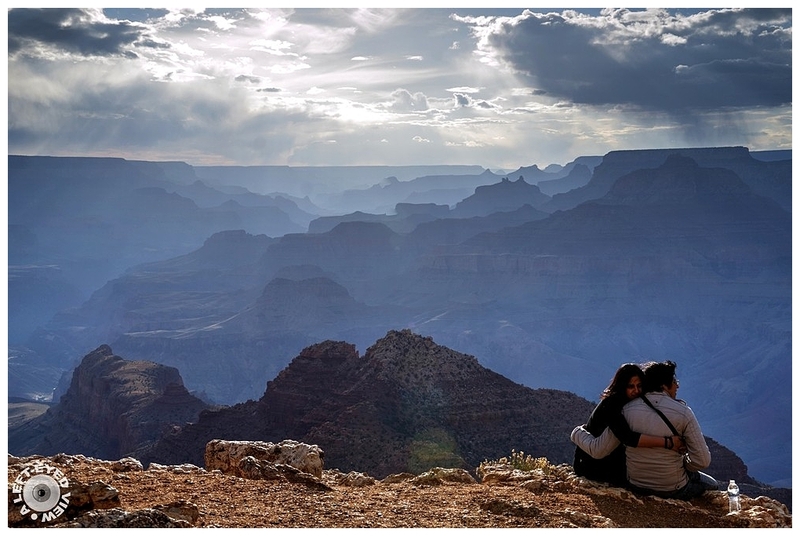 An unbelievable sighting while we were at the Indian Watchtower at Desert View was this couple sitting on the very rim of the Grand Canyon, where it was a long drop into the canyon. All it took was a wind, a sneeze, a rock crumbling or an unsuspecting person coming up from behind and startling them to lead to an unfortunate accident. I stayed far away from them! Rather than taking this photo for its beauty, I took the photo as documentation if the couple ended up missing or worse. I love the different shots of the mountains and their beautiful soft blue color. Lovers are alone in the world and if they think of something, it is probably not the fact that hundreds of people will see them on your site. LOL! Joli décor pour ces amoureux. I like the photo with the people on the mountain. She have the holy world for her self. They are enjoying this fabulous view. Magnifique ta photo les amoureux du bout du monde !!! Une très photo, belle composition et le couple est un plus, que du bonheur! What a view for this lovers ! Beautiful layers, composition and atmosphere ! I don't know ! but they are happy ant it's the best ! You made a very nice picture too. Wow, this is one of the most beautiful ST posts ! I agree to your behavior, you stayed far away from them. Maybe dreaming of the beauty of these mountains. Wonderful !! Love has no thoughts, this is to enjoy together. I hope you warned them not to sit there..instead of thinking " None of business" and walk away ! .... "Love makes us immortal..." ! There are people who like to take risks ... and then accidents happen. I am dizzy just looking at them ...A Fabulous photo ! Get lost you tiresome photographer!!! ;-) Wonderful composition and a stunning background!! A great view for this couple. It would be restful to just enjoy this wonderful landscape. Some people do careless and dangerous things. Happy Silly Tuesday! Some people are nuts! It's a beautiful photograph though. Très bon cadrage, tout à fait à mon gout ! J'aime le décor en arrière plan que tu as bien su mettre en évidence. This is a gorgeous image. I love the view of the canyon in the distance. Every year you hear about people falling to their deaths in Yosemite and the Grand Canyon. When I was at the Grand Canyon, a man was standing at the edge and his hat blew off of his head. He lunged forward to catch it and fell to his death. Even photographers in the group I was with would take chances and stand right at the edge for a better shot. Pretty scary.